PETA returns to Rajah Sulayman Theatre for re-staging their original translation by Alan Glinoga of a Bertolt Brecht creation. 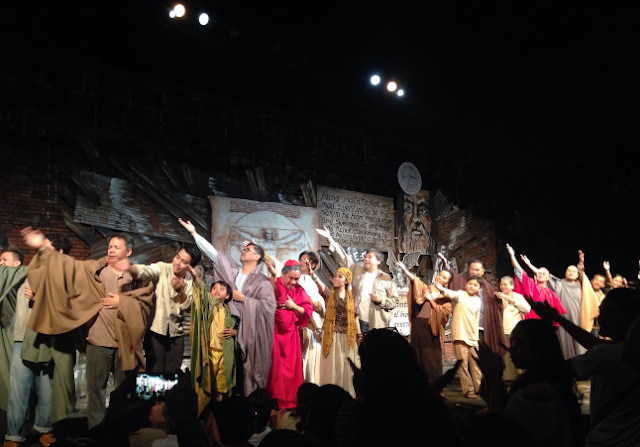 In celebration of the premiere theatre group’s 50th anniversary, Ang Buhay ni Galileo ran from November 29 to December 1 at an outdoor stage at Fort Santiago. The play talks about the struggles of spreading the truth by the polymath Galileo Galilei. This is directed by Rody Vera. All his life, Galileo Galilei tried to disseminate his discoveries about the universe. These trials and tribulations were quelled by the Roman Catholic as they are deemed as against the teachings of God. The entire show addresses the issue of the Church’s greed over power which transcends the current state of our society. PETA takes art seriously this time. Their previous productions focused more on the entertainment value. Ang Buhay ni Galileo proves that PETA knows what theatre should be. The cast is headed by veteran artist Joel Lamangan as Galileo who is a very credible lead. He is backed up by other theatre experts like Bodjie Pascua, Upeng Galang Fernandez, Jack Yabut and others. The production design by Brenda Fajardo was inspired by the Aesthetic of Poverty. We are absolutely hoping for another re-staging of Ang Buhay ni Galileo and more plays from PETA at the Rajah Sulayman Theatre.